Italian motorcycle manufacturer Ducati will be launching its updated range of Scramblers in India on April 26. This includes the Icon, Desert Sled and the Cafe Racer. The updates that have been given to the new range are not just aesthetics but also includes more features, cornering ABS as well as new suspension setup. 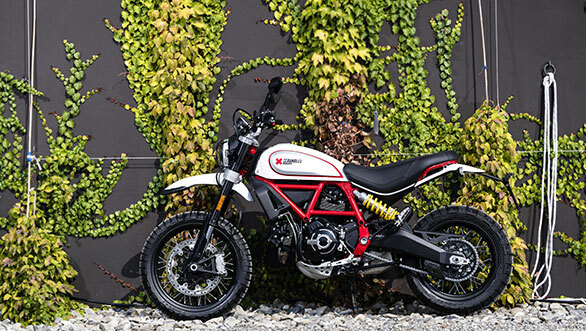 A select few Ducati dealerships have already commenced bookings for the 2019 Scrambler range and the deliveries are expected to commence from the end of this month. We expect the prices to up by Rs 50,000-Rs 60,000 than the previous iterations. The 2019 Ducati Scrambler gets an all-new headlight with LED DRL along with new auto-off LED indicators. It also gets more ergonomic switchgears that make it easier for the rider to scroll the LCD instrument menu, which now includes fuel level information. Something that was missing on the Scrambler 800 for long. The updated Ducati Scrambler gets wider handlebars, new flat seat, and a renewed suspension set-up apart from getting higher. In the release, Ducati mentions, low weight, low centre of gravity and slightly chunky tyre treads would offer better handling. The most important update in the 2019 Ducati Scrambler is the availability of Bosch 9.1MP Cornering ABS that is the first for its segment of motorcycles sold in the world. The 2019 Ducati Scrambler also gets an updated hydraulic clutch control with an adjustable lever that can alter the lever-handlebar gap according to individual needs. Additionally, the 2018 Ducati Scrambler also gets new, beefier aluminium side panels, black-painted engine, brushed cylinder head fins and machine-finished rims. The 2019 Icon will be available in the popular classic yellow shade along with the new atomic tangerine shade. We have recently ridden the 2019 Ducati Scramblers in Thailand. 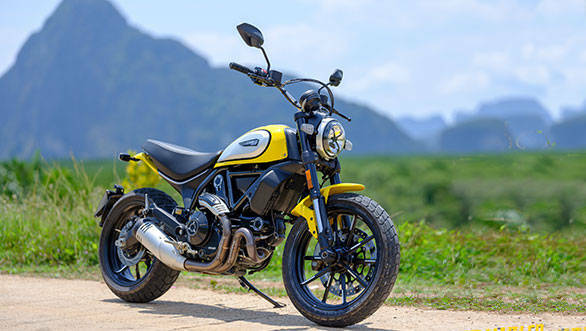 Here is our detailed first ride review of the 2019 Ducati Scrambler Icon 800. Click here to get our initial impressions of the 2019 Ducati Scrambler Desert Sled.